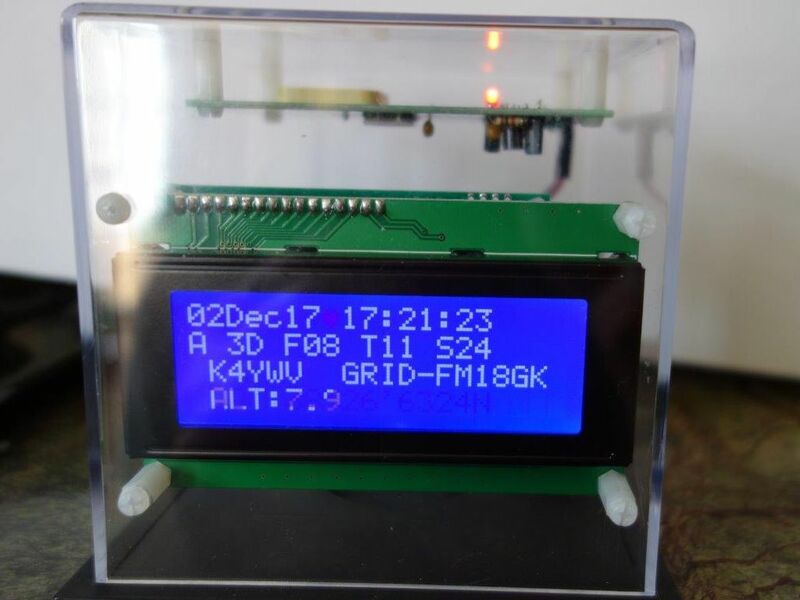 This is a shack clock kit which can optionally also be connected to a GPS receiver module such as the QLG1 to provide precise time. 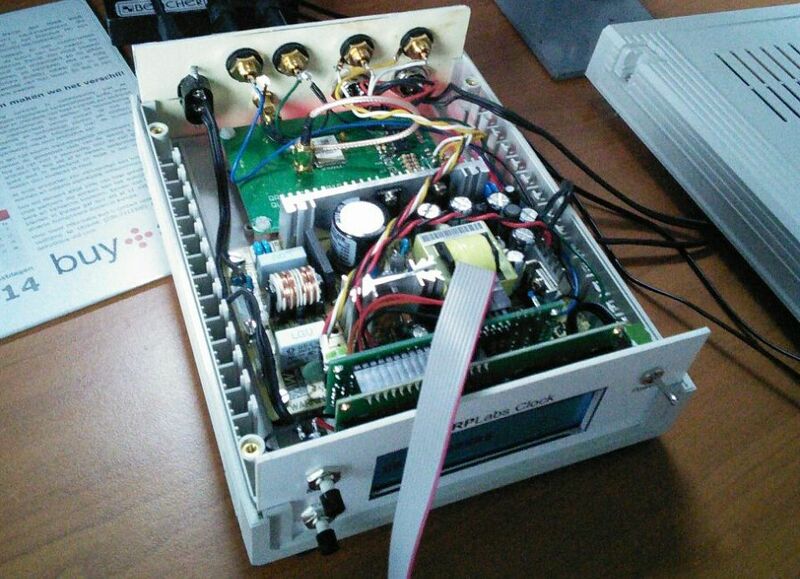 Alternatively it can be used standalone or with a different 1 pulse per second (pps) signal source. 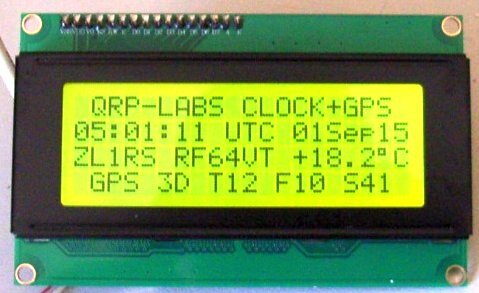 The clock can be configured to display time, date, and various information decoded from the GPS serial data stream. Two Analogue temperature sensors an optionally be connected to the kit, so that temperature measurements can be displayed (for example, indoor and outdoor temperature). The contents of the display are configurable. 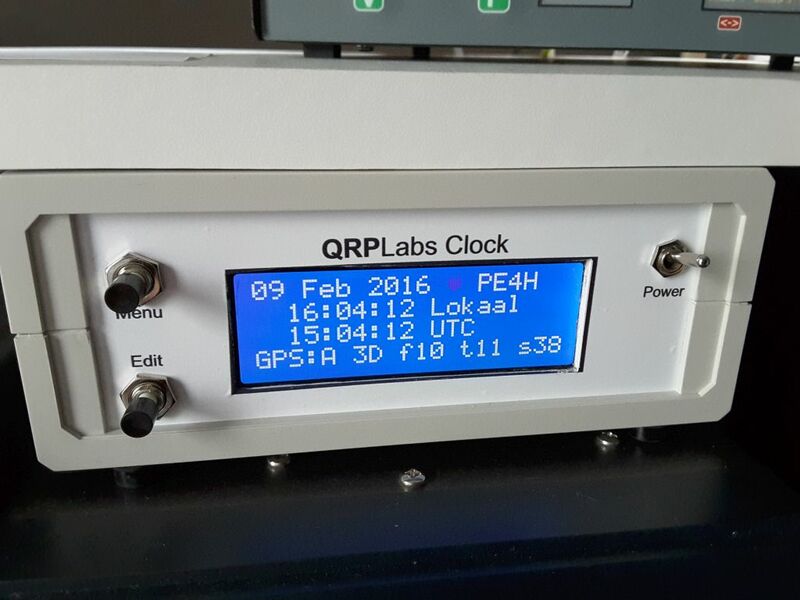 The photographs on this page show the default configuration of the clock display. 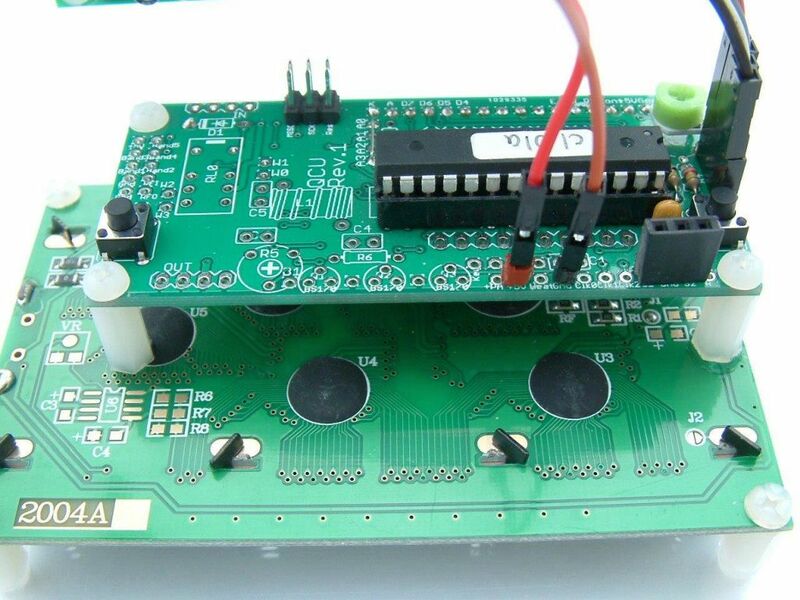 These are the instructions for the latest PCB revision and Firmware version. Please check your PCB and your firmware revision. If you have an earlier version use the correct documents in the next section. c1.01a 01-Dec-2015 - Just a recompilation under latest AVR Studio on Win 10. No new functionality or changes! c1.01 31.Aug.2015 - Support for 4 x 20 LCD. - Local Time Offset entry, in minutes. - #LH and #LM tags for local time hours and local time minutes. - #H2, #AP tags for local time hours in 12-hour format, and "AM"/"PM" display. - Added alarm function: Alarm, AlarmOn params. To cancel Alarm, press Right button. - Bug fix: Factory reset put temperature calibration values to non-Factory values. - Bug fix: If GPS latitude/longitude displayed on top row, it could cause some display corruption of row 2 in some cases. - Bug fix: Long message strings, overwrite the top LCD line when looping through menu. 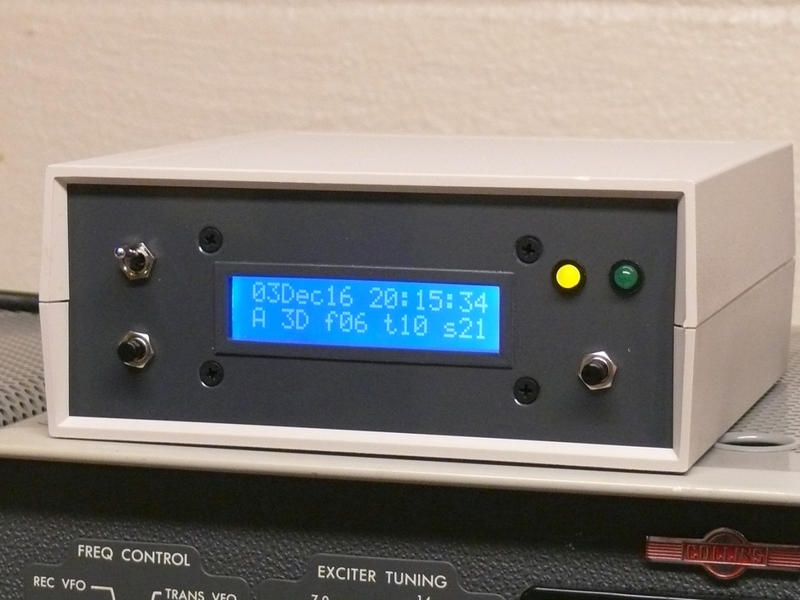 The clock firmware from firmware version c1.01 onwards supports a 4-row 20-column LCD. 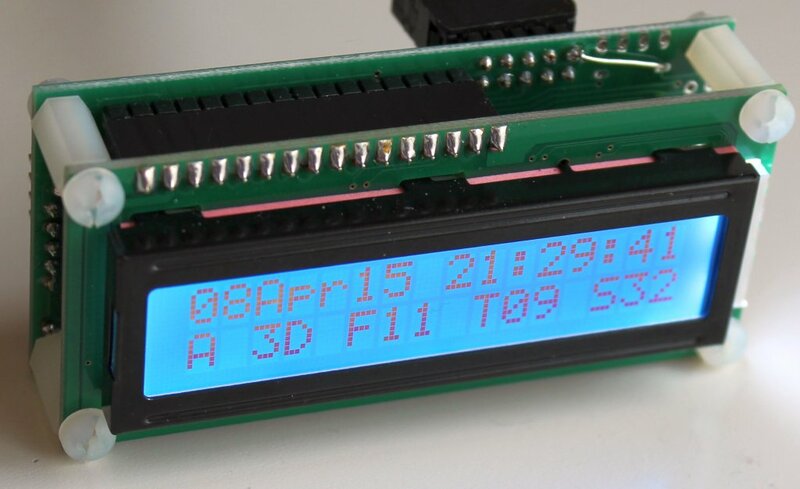 Each line can be configured, just the same way as the standard 16 x 2 LCD module supplied in the kit. 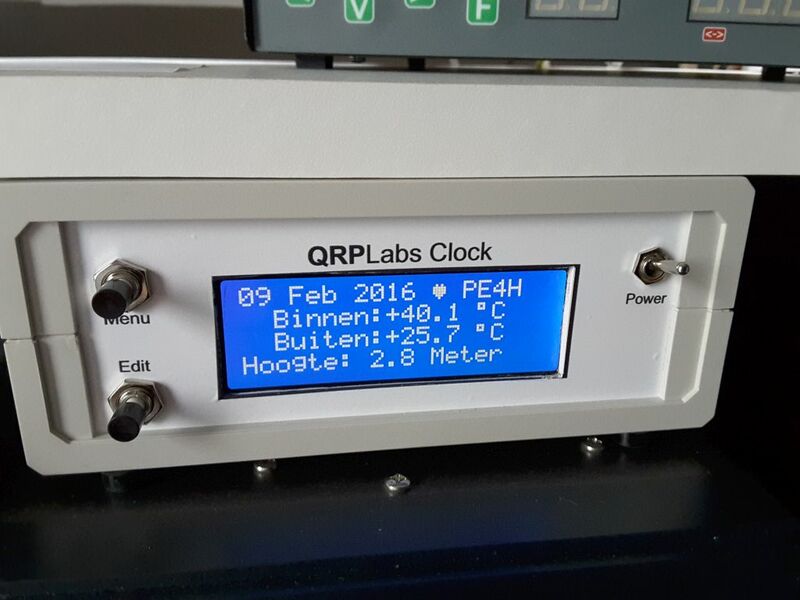 The following photograph shows a 4-line clock display by Bob ZL1RS. The photographs below show Henk PE4H beautifully made clock. 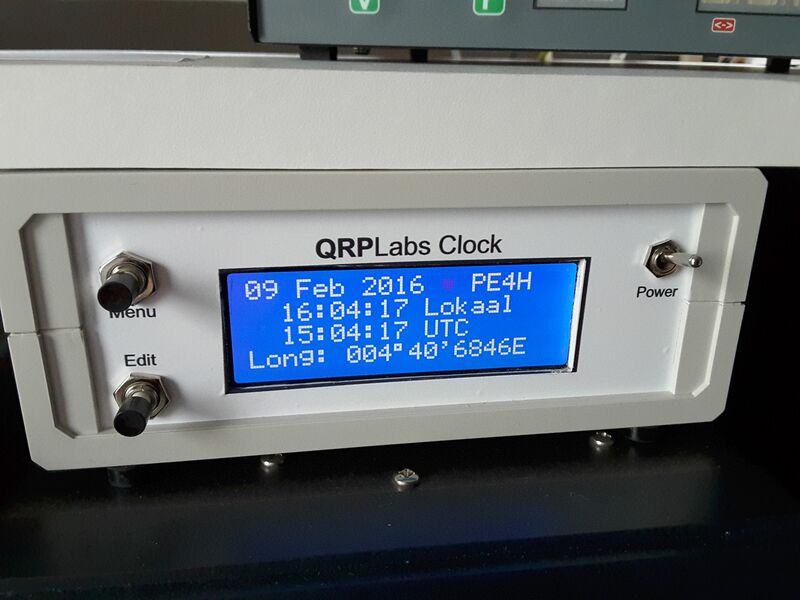 Like Bob ZL1RS above, Henk also uses a 4-line display. 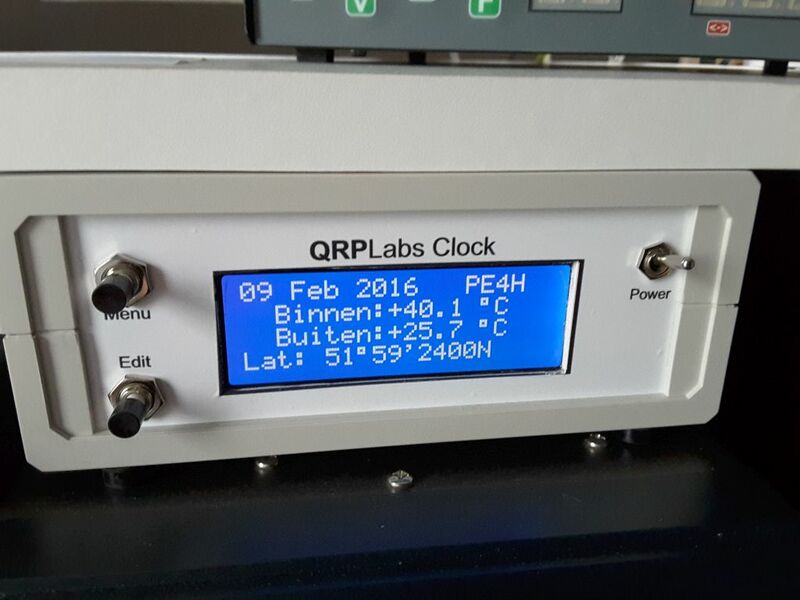 His enclosure includes power supply and QRP Labs QLG1 GPS. A unique step by Henk, was to incorporate lower case characters into the display. The configuration of the clock supports upper case characters only. But Henk read out the EEPROM .eep file, and edited it in AVR Studio 7's hex editor, replacing the desired upper case characters with lower case ones. "The case / cabinet is a Bud PC-11406. Front panel was painted with Rustoleum 'Charcoal Gray' (a close match to the Collins front panels). No lettering, as operation is simple, and at my stage of life, applying dry transfer lettering and getting it straight is a real challenge. The bezel around the display was necessary, as I can't cut a neat looking rectangular hole either (same reason as above). Rough cut the hole, then glued in the bezel, made from 1/8" (3mm) plastic angle stock from the hobby shop. All said, I'm real pleased with how it turned out!" 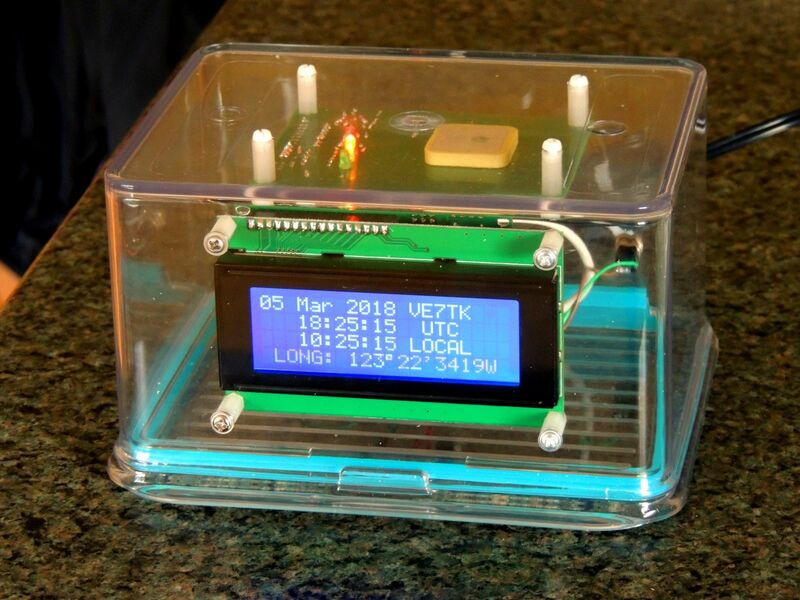 "I’ve finally built and cased the shack clock kit I bought a while back. 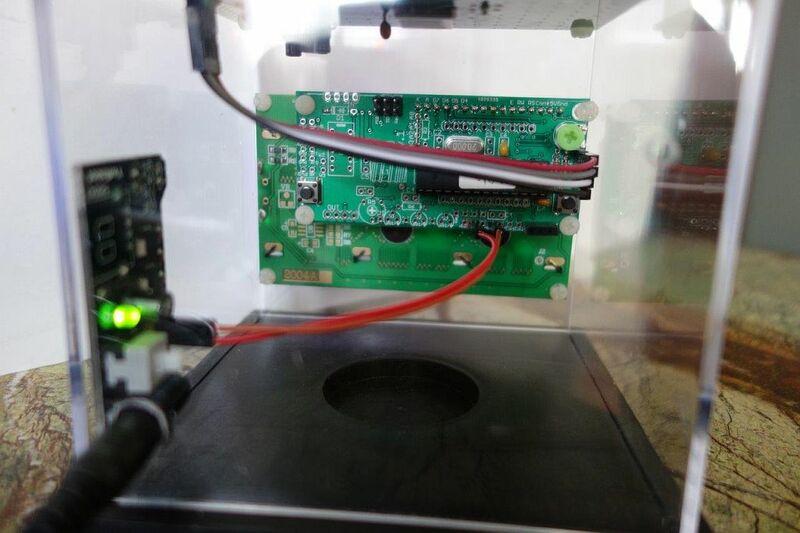 Very nice it is too…..
Picture shows my two solutions, one inside the 3.5mm stereo jack plug, on at the end of the outside wire prior to a blob of epoxy sealing it forever." "I used a plastic softball display case available from your nearby craft stores, usually less than $10 USD. US Stores ALWAYS have discount coupons on their websites. The plastic can crack, when you least expect as the one picture shows (I was going to add external menu button switches). I used smaller drills and progressed in size. 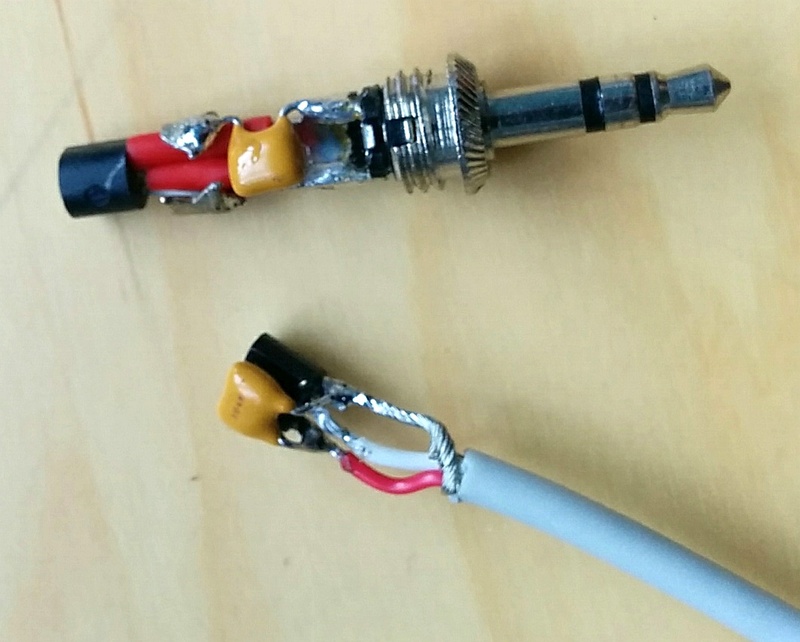 For the large hole for the coaxial plug I used the 3/8"(10mm) drill bit with my hand so as not to crack the case. Takes time and patience... but you'll be rewarded. A file or rasp could also be used to enlarge hole. 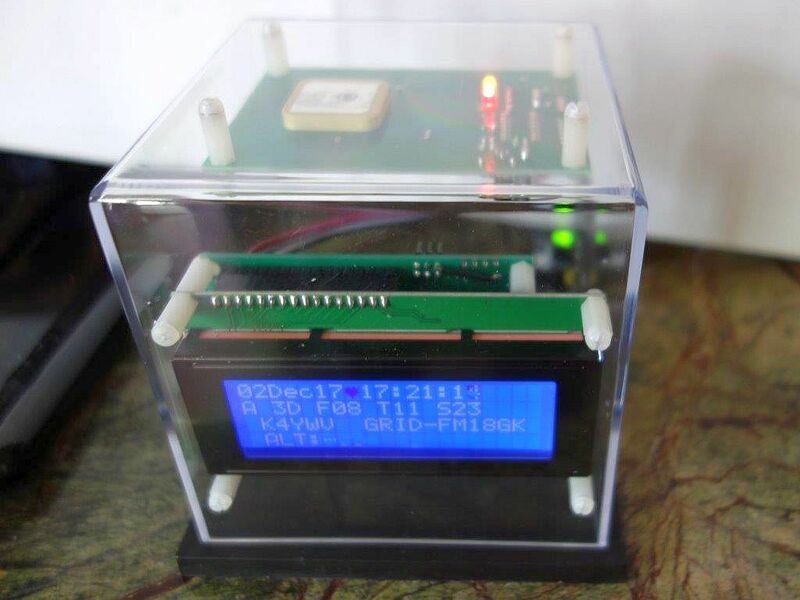 I used nylon standoffs to secure the GPS and Display module to the cube. For securing the clock to the 4 line display, I used small drop of epoxy on three of "legs" for clock and clipped the upper corner hole for use of nylon screw. For 5 Volts, I used a MB102 Breadboard Power Supply Module, available on ebay. This board has a small on/off switch so I did not add addition power switch (less is more). I removed all unnecessary pins, USB jack, etc on breadboard power module and clipped the bottom leads and reflowed solder to make as smooth as possible. Since the breadboard power has no holes for mounting, I used three globs of epoxy. 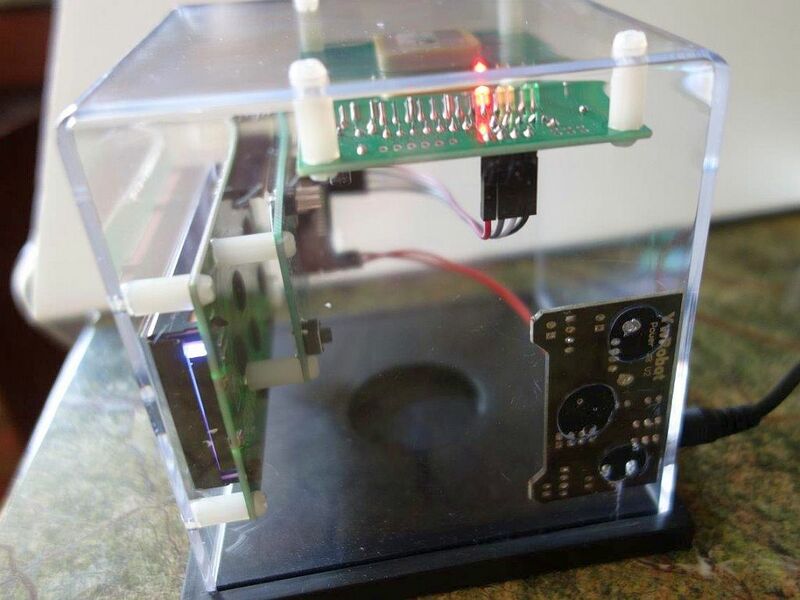 I did not add external switches for programming, as they are easy enough to access on rear of clock PWB. I drilled a smaller hole to access the contract VR...if needed. I left the original first two lines in the program, added Call Sign, Grid square, Long./Lat./Altitude scroll on the 3rd and 4th lines." "I liked the "baseball" case idea from KA3BWP. However, I was unable to find a case locally. Instead I used an air tight refrigerator storage dish made by Inter-Design Kitchen Binz 6.75 in x 5.75 in x 3.75 in (17.2 cm x 14.6 cm x 9.5 cm) at a cost of approximately $12.75 US. 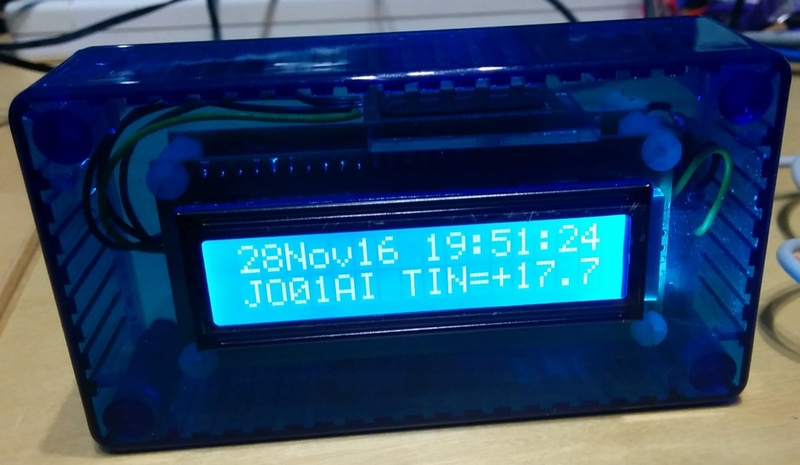 I installed a 4-line display with the top 3 lines static while the 4th line scrolls the Latitude, Longitude, Altitude and Grid Square."